The profile on the obverse (front) side of the coin is Lady Liberty. The spiked crown that she wears is purposely reminiscent of the crown worn by the Statue of Liberty. The word “LIBERTY” stretches above Lady Liberty’s head, passing behind the spikes of her crown. The overlapping letters “AF” appear below Lady Liberty’s neck. 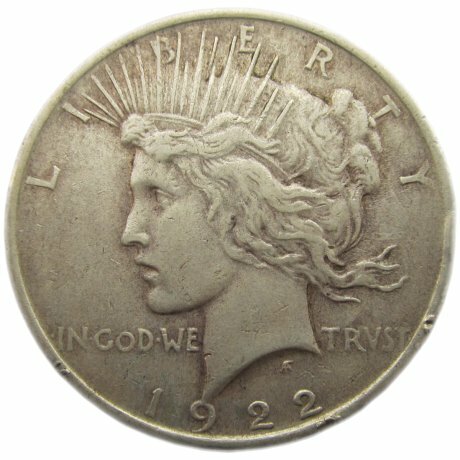 “AF” are the initials of the Peace Dollar’s designer, Anthony de Francisci. Below the profile is the motto “In God We Trust.” As in many older carvings and inscriptions, the “U” in “Trust” is rendered like a “V,” giving the motto an ancient Roman look. The date appears below the motto. Filed under Coins Obverse, Peace Dollar. The coins in this collection were acquired by my grandmother over a period of about forty years. What makes this collection unique is that almost without exception these are coins she found in ordinary pocket change. This site is a work in progress as I continue to document the coins in her collection. ... for using our Amazon links! 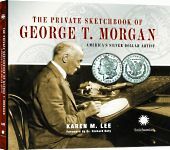 Copyright © 2013-2019 by A Very Special Coin Collection, all rights reserved.